South Korea has experienced remarkable success in combining rapid economic growth with significant reductions in poverty. It is now the world’s 15th largest economy and is the first former aid recipient to become a member of the Development Assistance Committee (DAC) of the Organization for Economic Cooperation and Development (OECD). President Park Geun-Hye was impeached. Centre-left candidate Moon Jae-in was elected as president. Kim Jong-un met President Moon Jae-in for talks at the Panmunjom border crossing. The joint summit was the first meeting between leaders of North Korea and South Korea since 2007. South Korea has been a WTO member since January 1, 1995 and a member of the General Agreement on Tariffs and Trade (GATT) since April 14, 1967. In the past, South Korea's trade policy placed heavy emphasis on import control and export growth promotion. The South Korean government has revised its trade policy to a more neutral stance in recent years, which includes, among other things, forging free-trade agreements (FTAs) with other countries. South Korea has entered into 16 FTAs covering over 50 countries, including with the EU, the US, ASEAN, Singapore and China. South Korea is also engaged in negotiations for a further nine FTAs, including with Ecuador, Mexico, the Gulf Cooperation Council, Indonesia, Israel and Japan. 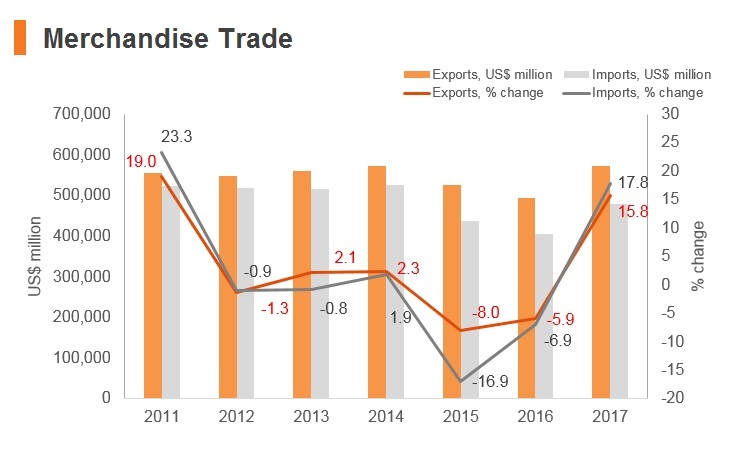 In terms of trade barriers, South Korea continues to pursue economic liberalisation and deregulation, with low levels of bureaucracy and streamlined trade procedures easing the overall trading process and lowering import costs. Customs duties can be adjusted every six months, within the limit of the basic rate. South Korea also has a flat 10% VAT on all imports, with a special excise tax of 10-20% levied on the importation of certain luxury items and durable consumer goods. Tariffs and taxes must be paid in South Korean won within 15 days after goods have cleared customs. Average import tariff rates currently stand at 5.2% and are the joint-highest in the East and South East Asia region, alongside Laos. The South Korean government maintains a tariff quota system designed to stabilise certain domestic commodity markets. Some of the major barriers to trade involve the rice industry, with the Ministry of Agriculture, Food and Rural Affairs implementing a number of measures to support domestic rice production, including rice farmer income subsidies and a hefty rice import tariff. 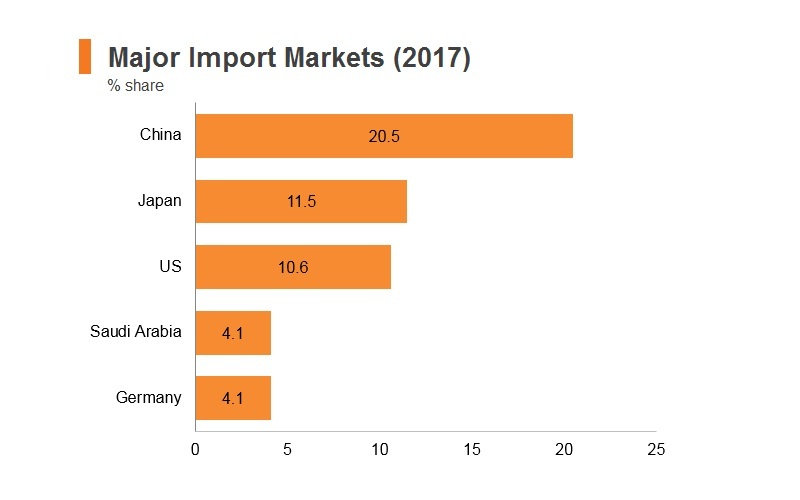 In January 2015, the government of South Korea implemented a 513% tariff on over-quota imported rice, affecting partners such as China, the US, Japan, Australia and India. 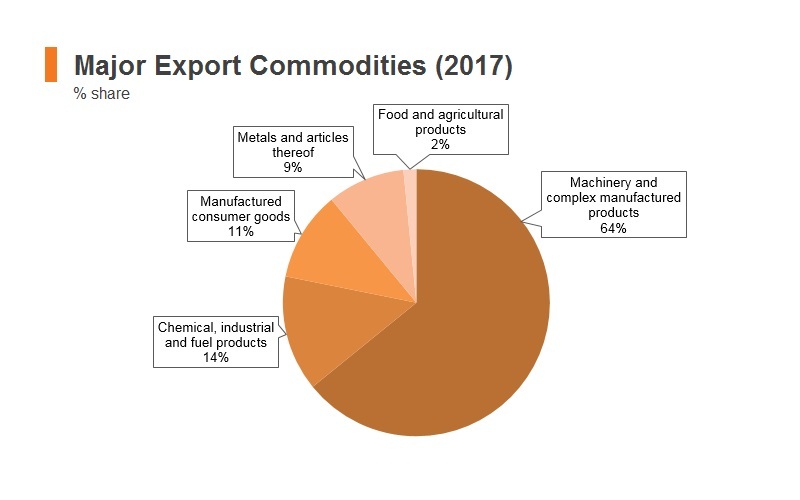 Imports of rice have an import quota of 409,000 tonnes a year, and products such as crude oil are also subject to tariffs, significantly increasing the costs of imported inputs for businesses in these industries. 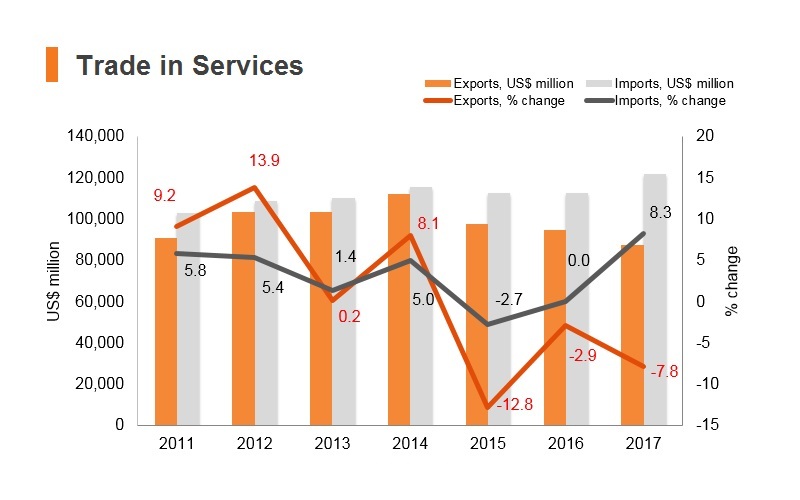 To support the export sector, in 2016 the South Korean government announced plans to offer KRW4.8 trillion (US$4 billion) in trade-related financing, lowering export insurance premiums and expanding tax incentives for small- and medium-sized enterprises (SME) looking to export. 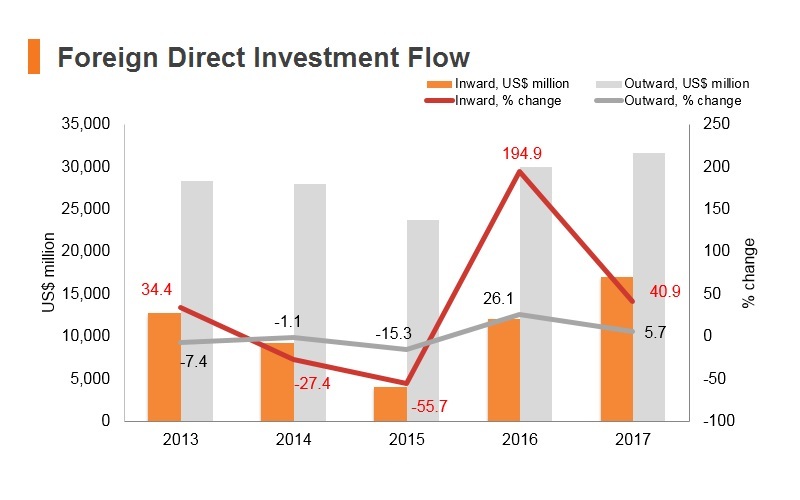 It is reported that the South Korean government has set aside KRW372.9 billion (US$330 million) of funding in 2017 for overseas marketing events and trade missions. In its 2018 economic policies, the government has committed more support for SME exporters. The trilateral free-trade agreement between South Korea, Japan and China has been under negotiation since 2012, and the 13th round of negotiations was held in March 2018. In addition, South Korea is engaged in negotiations on the Regional Comprehensive Economic Partnership (RCEP), a proposed FTA among 16 countries including 10 ASEAN countries, Australia, China, India, Japan and New Zealand. In 1997, following the amendment of the Customs Act and its Enforcement Decree, South Korea simplified import procedures and required documentation. Most goods can now be imported without licences, except items restricted for health or security reasons. All of Hong Kong's leading export products can be freely imported into South Korea. Most duties are assessed on an ad valorem basis. For non-agricultural products, about 90% of goods are charged at tariff rates from 0% to 10%. Tariff rates for leading import items from Hong Kong (eg, electrical machinery) range between 0% and 13%. In addition to tariffs, imports are also subject to other taxes, including a value-added tax (VAT). The VAT rate on imports is 10% of the cost, freight and insurance (CIF) value plus customs levies. In addition, a special excise tax or individual consumption tax, which ranges from 2% to 20%, is levied on certain luxury and durable consumer items. The South Korean government still maintains a safeguard mechanism, in which high tariffs are imposed on certain products, protecting local industries that are vulnerable to global competition. For example, certain agricultural products are subject to duties above 100%. Meanwhile, some non-agricultural products, such as leather and footwear, are taxed up to 16%. South Korea's average import tariff rate of 5.2% is the joint-highest in the East and South East Asia region. The South Korean government maintains a tariff quota system designed to stabilise certain domestic commodity markets. 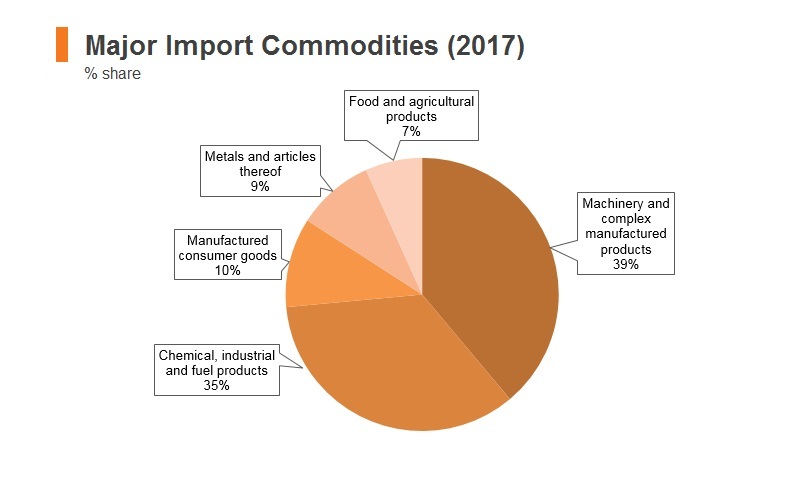 Imports of rice (which also have an import quota of 409,000 tonnes a year) and crude oil in particular are subject to tariffs, significantly increasing the costs of imported inputs for businesses in these industries. Nevertheless, South Korea is continuing its process of economic liberalisation, maintaining streamlined trade procedures that minimise overall import costs. In July 2014, an individual consumption tax was imposed on imported coal used for power generation. The purpose of the measure was to tackle excessive electricity consumption and to rationalise the domestic energy price structure. At the same time, taxes for other alternative imported fuels, such as liquefied natural gas (LNG), kerosene and propane, were lowered. 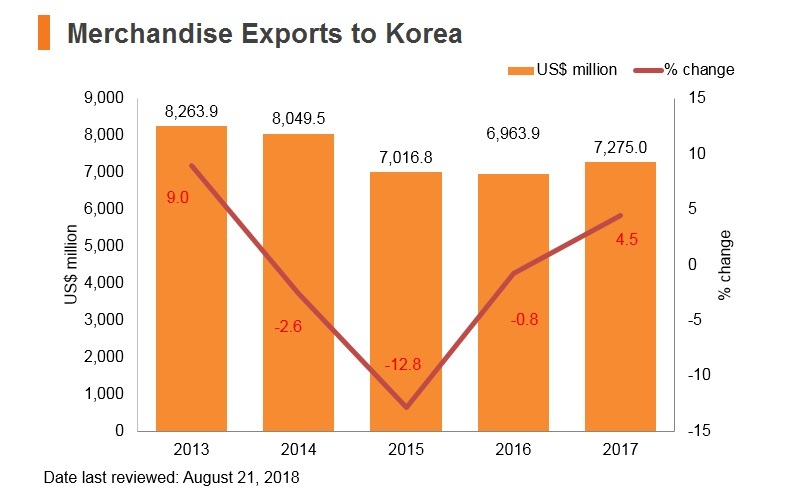 Generally, trade bureaucracy in South Korea is relaxed, with the country having an increasingly open attitude toward imported goods. Korea-Australia Free Trade Agreement (KAFTA): KAFTA entered into force on December 12, 2014. South Korea is Australia's fourth largest trading partner, and under this agreement, tariffs on 84% of Australia's exports to South Korea were eliminated; tariffs on 96% of current exports will be eliminated within 10 years; and by the time the agreement is fully implemented, tariffs on 99.8% of Australia's current exports to South Korea will be eliminated. Products representing about 0.2% of Australia's current exports to South Korea will be excluded from the agreement, namely: rice, milk powder, honey, abalone, ginger, apples, pears and walnuts. South Korea-US FTA (KORUS): This agreement came into force in 2012, and was the first FTA between the US and a major Asian economy, as well as its largest trade deal since the North American Free Trade Agreement (NAFTA) in 1994. 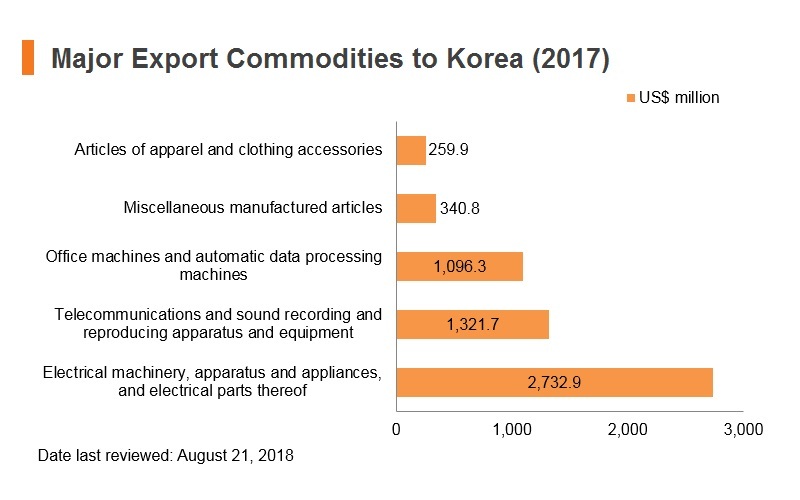 Under KORUS, almost 80% of consumer and industrial products exported to the US from South Korea became duty free on March 15, 2012, and this had been expanded to 95% by 2017. Most remaining tariffs will be eliminated in the medium term. 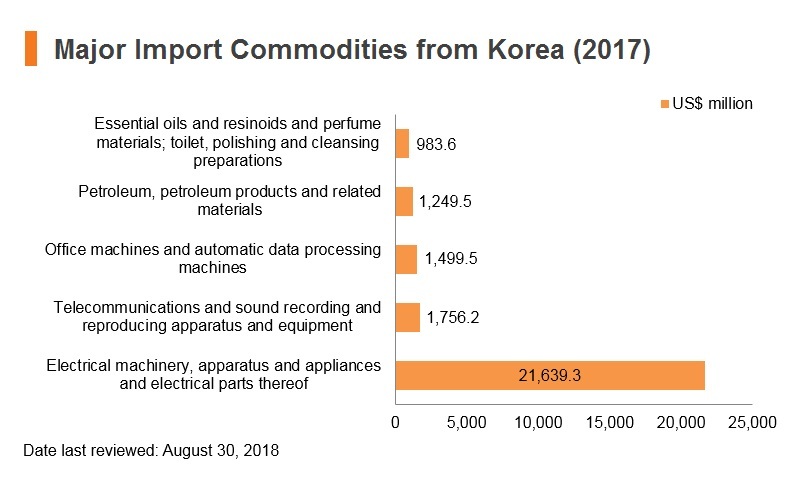 For a broad range of agricultural products, KORUS eliminates tariffs and quotas, with almost two-thirds (by value) of South Korea's agricultural imports from the US becoming duty free. For services, KORUS provides meaningful market access commitments that extend across virtually all major service sectors, including greater and more secure access for international delivery services and the opening up of the South Korean market for foreign legal consulting services. In the area of financial services, KORUS increases access to the South Korean market and ensures greater transparency and fair treatment for US suppliers of financial services. KORUS addresses non-tariff barriers in a wide range of sectors and includes strong provisions on competition policy, labour, the environment, transparency and regulatory due process. Korea-China FTA: This FTA was implemented in December 2015, and has significant implications for both sides, as it aims to eliminate more than 70% and 90% of import tariffs within the next 10 and 20 years respectively. 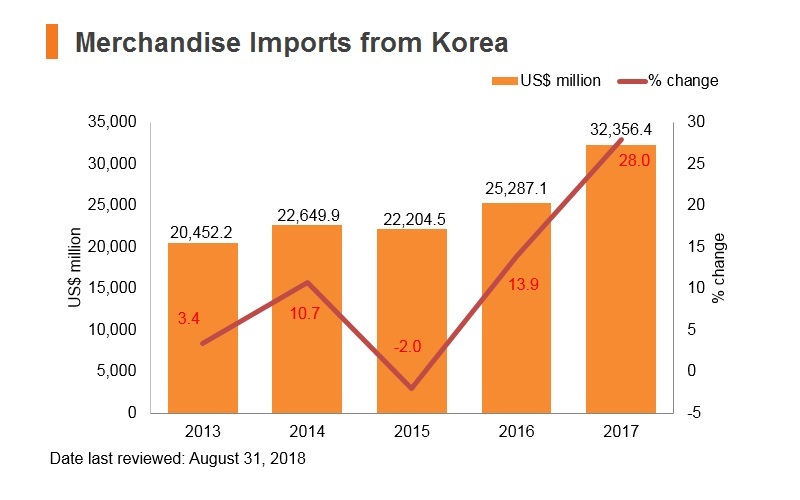 South Korea’s bilateral trade with China reached US$240 billion in 2017. In comparison, bilateral trade with the US and EU in the same year were US$119 billion and US$111 billion respectively. Korea-India FTA: A Closer Economic Partnership Agreement between South Korea and India was implemented in 2010, with an aim to enhance economic cooperation between the two countries through the facilitation of productive competition. The goal is to make a substantial contribution to the economic integration of South Asia and the Asia Pacific region. The agreement will gradually remove tariffs on more than 90% of traded goods within two decades. EU-South Korea FTA: This agreement entered into force in July 2011, with an aim to eliminate duties for industrial and agricultural goods in a progressive, step-by-step approach. The majority of import duties were already removed when the FTA entered into force on July 1, 2011. On July 1, 2016, import duties were eliminated on all products except for a limited number of agricultural products. In addition to eliminating duties on nearly all goods, the FTA addresses non-tariff barriers to trade with specific focus on the automotive, pharmaceuticals, medical devices and electronics sectors. The agreement also creates new opportunities for market access in services and investments, and includes provisions in areas such as competition policy, government procurement, intellectual property rights, transparency in regulation and sustainable development. The EU and South Korea are important trading partners; South Korea is the EU's 10th largest export destination. Korea-Japan Free Trade Agreement (KJFTA): KJFTA will be of benefit to businesses due to the high trade volumes between the two countries, and will create potential for businesses to explore new markets in the region. The scope of the KJFTA can be categorised into three main areas: trade liberalisation and market access through concessions for trade in goods and services; enhanced cooperation for non-trade areas; and institutional arrangements centred on a dispute settlement mechanism. Invest Korea (IK) is Korea's national investment promotion agency, established as part of the Korea Trade-Investment Promotion Agency (KOTRA) to support the entry and establishment of foreign businesses in Korea. To promote inward foreign direct investment (FDI), the Korean government offers various incentives, including cash grants and tax breaks. Following the onset of the financial crisis in 2008/2009, the Korean government took further active steps to promote FDI. In 2008-2010, corporate taxes were reduced, administrative procedures streamlined and the maximum amount of foreign capital that can be lent or borrowed without reporting the transaction was increased. In addition to strengthening the rights of foreign investors, the South Korean government has also taken measures to simplify procedures for mergers and acquisitions, reform bankruptcy laws, introduce short-term measures to facilitate asset transfer, permit the establishment of holding companies and allow foreign investment companies to freely acquire land without limitations on the size and use of land. 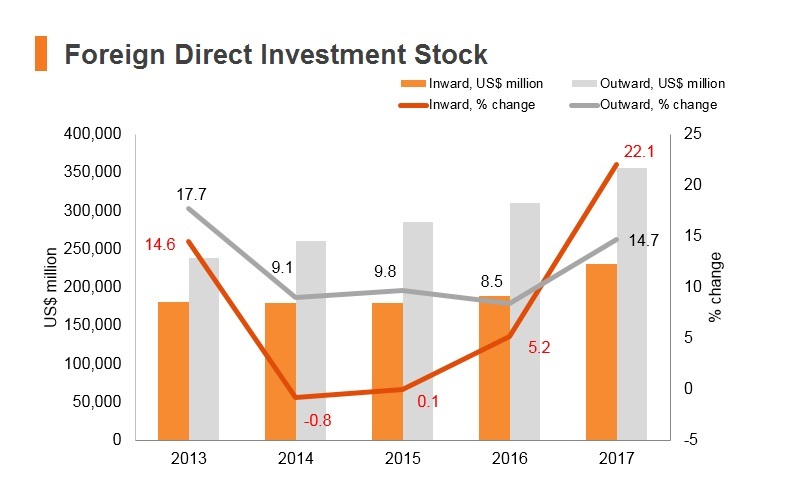 To bolster less-developed regions outside Seoul through private investment, the Korean government announced a series of pro-investment measures in 2014, which included deregulations and tax incentives. For example, development restrictions will be lifted to allow the construction of commercial facilities in green-belt areas. 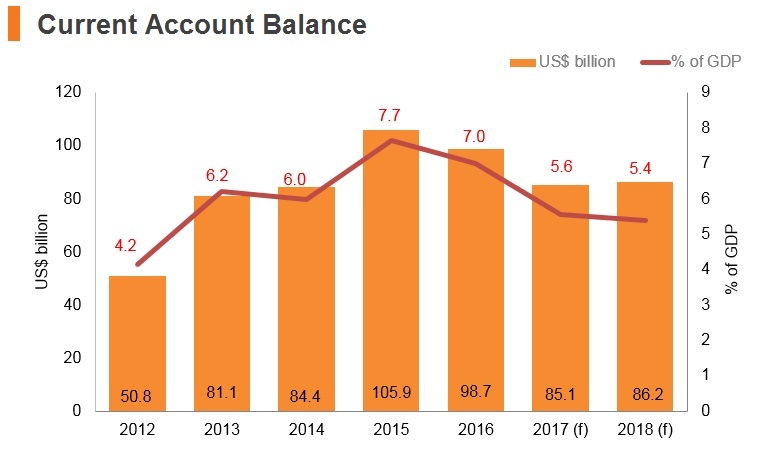 In 2015, the Bank of Korea enlarged the Bank Intermediated Lending Support Facility by KRW5 trillion (US$4.5 billion), providing additional financial support, such as trade financing and credit loans to SMEs and tech start-ups. In 2017, a new set of measures were introduced to spur investment, which include creating a tourism brand in the Southern coastal area, allowing the distribution of draft beer made by microbreweries and using apartment complexes’ parking lots for paid parking space during the day. The Ministry of Strategy and Finance (MOSF) administers tax and other incentives to stimulate advanced technology transfer and investment in high-technology services. There are four types of special areas for foreign investment - Free Economic Zones (FEZ), Free Trade Zones (FTZs), Free Investment Zones (FIZ) and Tariff Free Zones (TFZ), where favourable tax incentives and other support for investors are available. A number of highly favourable trade and investment opportunities - especially for large, hi-tech businesses - offer a tax reduction or exemption for five to seven years, a rent reduction of 50-100% and cash grants of not less than 5% of the invested amount. According to the FEZ Planning Office, the eight FEZs attracted US$5.6 billion in FDI between 2004 and 2015, with over 2,180 companies doing business there. The FEZs differ from other zones designated for foreign investment in their focus on creating a comprehensive living and working environment with biotechnology, aviation, logistics, manufacturing and other industrial clusters, as well as international schools, recreational facilities and international hospitals. There are also six foreign-exclusive industrial complexes in Korea. These are located in different parts of the country and designed to provide inexpensive plant sites, with the national and local governments providing assistance for leasing or selling in such sites at discounted rates. Moreover, there are two types of Foreign Investment Zones (FIZs) designated for foreign-invested SMEs and large foreign-invested companies respectively. Land purchase, rent subsidies and tax incentives are offered in those FIZs. Foreign investment on service industries including tourism, logistics and other business services are also encouraged. Besides, qualified foreign investment can be exempted from customs duties, VAT, and special excise tax on imported capital goods for the first three years. Korea’s Financial Services Commission (FSC) introduced the omnibus account system for foreign investors in stocks trading in March 2017, which is an integrated and simplified registration system for foreigners to make it easier for foreign investors to trade locally-listed stocks in the Korean stock market. In the past, foreign investors had to open an account not only in Korean banks but also in Korean securities companies to make an investment in Korean stocks, and they had to handle all financial transactions themselves. The omnibus account was extended to cover bonds and derivatives trading in June 2017. 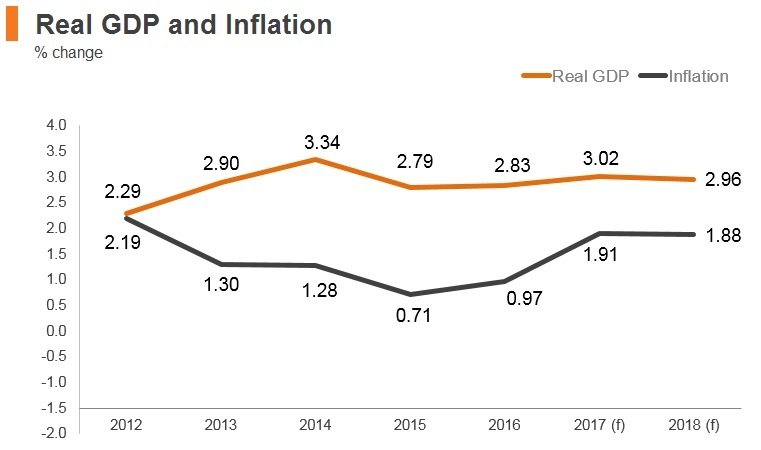 Despite an increasingly open economy, there remain market access issues relating to certain aspects of the South Korean economy. Products that compete directly with current or future offerings of South Korean chaebols (large conglomerates) would likely continue to be protected by the South Korean government in the medium term. The Foreign Investment Promotion Act (FIPA) is the basic law pertaining to foreign investment in South Korea. FIPA and related subordinate regulations categorise business sectors as being either open, conditionally or partly restricted, or closed to foreign investment. The South Korean government reviews restricted sectors from time to time for possible further openings. According to the Ministry of Trade, Industry and Energy (MOTIE), the number of industrial sectors open to foreign investors is well above the OECD average. Currently, restrictions on foreign ownership of public corporations remain, although ownership limit levels have been raised. Foreign ownership is limited to 49% for government-controlled utilities, such as telecommunications and cable networks. The state-owned Korea Land and Housing Corporation is given preferential access to developing state-owned real estate projects, notably housing. The South Korean government has sought to control the market through a series of capital control measures under the name of 'macro-prudential stability policy'. This includes lowering foreign exchange forward-position limits for foreign bank branches in 2010, re-introducing a withholding tax on foreign investors' government bond purchases and imposing a bank levy on non-deposit financing in foreign currency from August 2011. To date, the government has lowered the forward-position limits again and changed bank levy provisions to promote long-term financing. 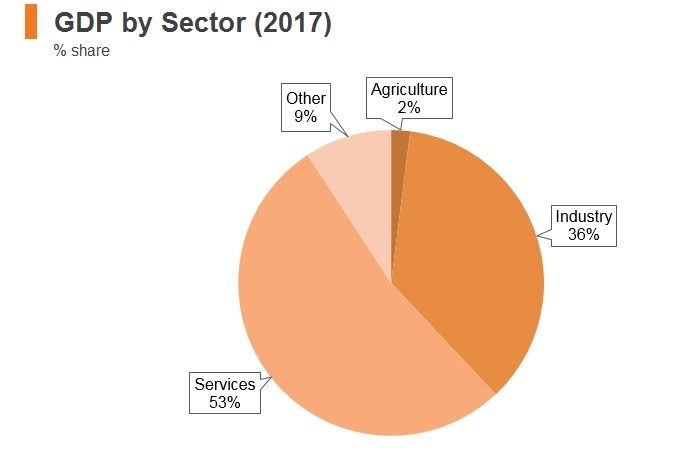 Overall, restrictions on foreign ownership remain for 27 industrial sectors, though nuclear power generation, radio and television broadcasting are entirely closed to foreign investment. Relevant ministries must approve investments in conditionally or partly restricted sectors. Most applications are processed within five days; cases that require consultation with more than one ministry can take 25 days or longer. Korea's procurement processes comply with the WTO Government Procurement Agreement, but some implementation problems remain. Foreign-exclusive industrial complexes in Gyeonggi Province (Hyungok, Pyosung, Chupal, and Hansan) These are designed to provide inexpensive plant sites, with the national and local governments providing assistance for leasing or selling in such sites at discounted rates. Free Economic Zones (FEZ): Incheon (near Incheon Airport, to be completed in 2020); Busan/Jinhae (in South Gyeongsan Province, to be completed in 2020); Gwangyang Bay (in South Gyeongsan Province, to be completed in 2020); Yellow Sea (in South Chungcheong Province, to be completed 2020); Daegu/Gyeongbuk (in North Gyeongsan Province, to be completed in 2020); Saemangeum/Gunsan (in North Jeolla Province, to be completed in 2020); East Sea (in Donghae and Gangrung); and Chungbuk (in North Chungcheong Province) The FEZs differ from other zones designated for foreign investment in their focus on creating a comprehensive living and working environment with biotechnology, aviation, logistics, manufacturing and other industrial clusters, as well as international schools, recreational facilities, and international hospitals. Foreign invested enterprises in FEZs are exempted from corporate income tax and income tax for five years (100% for the first five years; 50% for the following two years) and import tariffs are exempted for three years on capital goods. This applies to foreign investment of US$10 million for the manufacturing and tourism sectors, or US$5 million in the logistics and medical fields. The South Korean government expects to increase the minimum investment for the former to between US$20 million and US$30 million, and US$10 million for the latter, as well as increasing incentives in the short term. In addition, all capital goods are exempt from VAT for three years. Free Trade Zones (FTZs): Donghae, Suncheon, Gunsan, Daebul, Masan, Ulsan, Gimje, Yulchon, and seven logistics areas near airports and harbours In FTZs, companies may pursue their business with government support without the usual legal requirements, such as approval procedures for exports and imports and customs duties. Neither VAT nor tariffs are applicable on foreign goods or services exchanged among tenants or on domestic goods carried into a free trade zone. Tenants enjoy low rentals and subsidies for facilities, employment and training. Administrative agents from the Ministry of Trade, Industry and Energy are stationed nearby to provide one-stop services and support for all administrative affairs such as factory construction and registration, foreign investment, tax breaks and import/export paperwork. There is also rent-free lease of land and standardised factories for 10 years for foreign invested companies, of which foreign ownership is at least 30%, or the largest shareholder is a foreigner, and up to 75% exemption if the investment is over US$5 million. There are tax breaks available for manufacturing investment of more than US$10 million for five years (100% for first three years; 50% for the following two years). The South Korean government announced a series of new tax measures in August 2017 that would come into effect for fiscal years commencing after January 1, 2018. The most important of these for businesses is the addition of a new corporate income tax rate of 25% for taxable income of more than KRW300 billion (approximately US$270 million). The income tax rate for all income below KRW200 billion remains set at 22%, but the new rate will somewhat weigh on profit margins for larger businesses based in the country. Other tax information A flat rate of 7% applies to small- and medium-sized enterprises and large companies within the four-year grace period; after this grace period, an 8% rate applies for large companies for the following three years and a 9% rate applies for two additional years. Even if a taxpayer benefits from tax incentives, such as tax credits or exemptions, the taxpayer should pay at least the minimum tax. The minimum tax is calculated as the tax base (before applying tax credits or exemptions subject to the minimum tax) multiplied by minimum tax rates. Some tax incentives may not be utilised where the tax liabilities after the tax incentives are below the minimum tax. Employers who wish to employ low-skilled foreign labour must first demonstrate that they have spent at least 14 days (seven days in some cases) attempting to find Korean workers by requesting help from public employment centres. 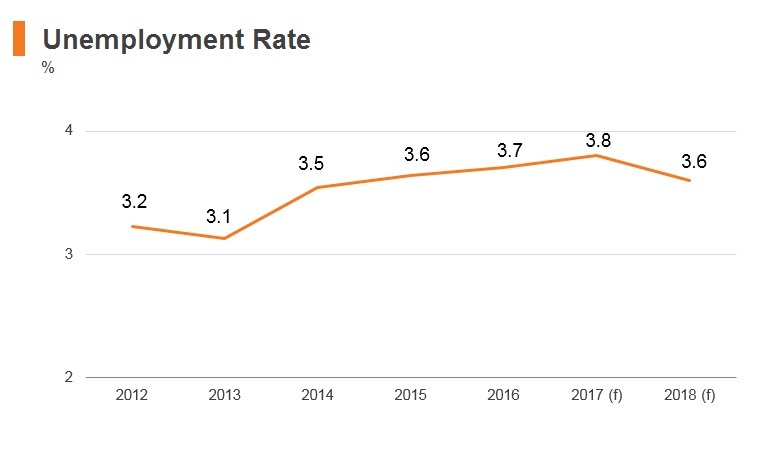 Long a country of emigration, South Korea is increasingly opening itself to immigration in the face of falling fertility rates and labour shortages. By 2002, unauthorised workers represented 70% of South Korea's total foreign labour force. Since 2002, South Korea has taken a number of steps to overhaul its labour migration system. This resulted in gradually loosened controls and a declining unauthorised population. In 2003, the Korean government introduced the Employment Permit System (EPS), a guest worker scheme that provides a framework for the entry of temporary low-skilled foreign labour. EPS is divided into two subsystems: the General EPS based on Memoranda of Understanding drawn up between the South Korean government and sending countries (16 countries in 2017) and the Special Case EPS granting foreign nationals of Korean ancestry visiting worker status so they can get a job in South Korea. Skilled workers, including researchers and language teachers, are welcome to temporarily work and live in South Korea. When they have valid employment contracts, skilled workers can easily acquire work visas and can renew their visa status. Some international talents, including technology workers, can move to Korea through an express procedure. Under the General EPS, Korean employers can enter into employment contracts with foreign workers who pass a Korean language proficiency test and are determined to be in good health. Foreign workers brought in under the General EPS receive E-9 nonprofessional employment visa status, while those under the Special Case EPS are given H-2 visiting worker status. H-2 visa holders do not need an employment contract before entering Korea, and there are no restrictions on employment sectors and workplace changes for them. E-9 visa holders need an employment contract, are tied to their employer, and are restricted to certain sectors, including agriculture, construction, fishing and manufacturing. Family members of low-skilled foreign workers are not allowed to settle in Korea, a restriction designed to dissuade workers from permanent settlement in South Korea. 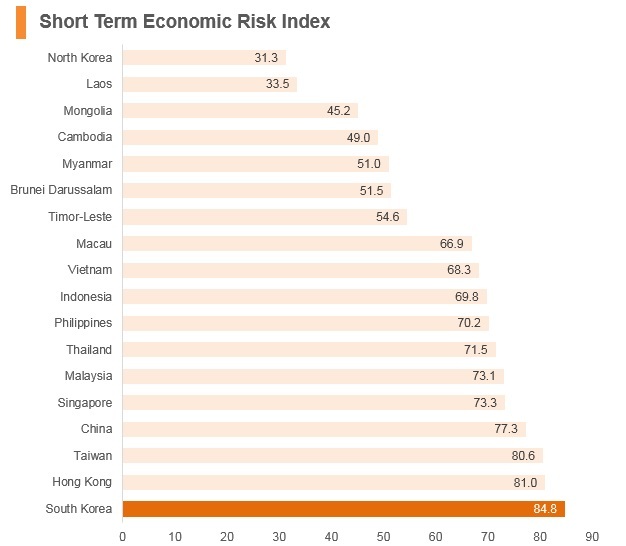 South Korea's short-term economic risk outlook has improved considerably, reflecting the sharp recovery in the South Korean economy. 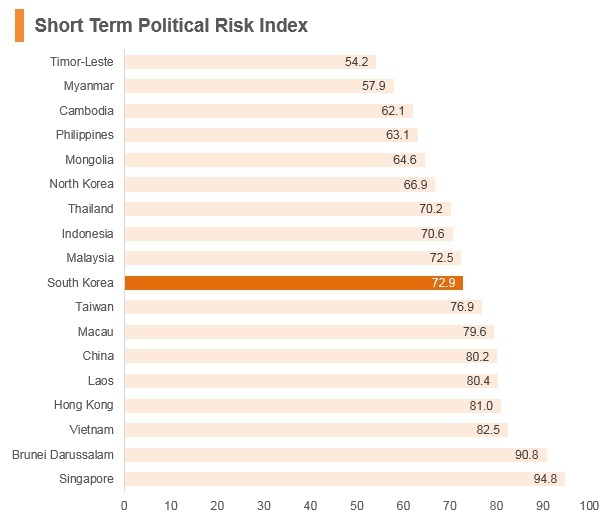 South Korea's long-term outlook is comfortably above that of its regional peers, reflecting a favourable outlook on the country's long-run growth prospects. 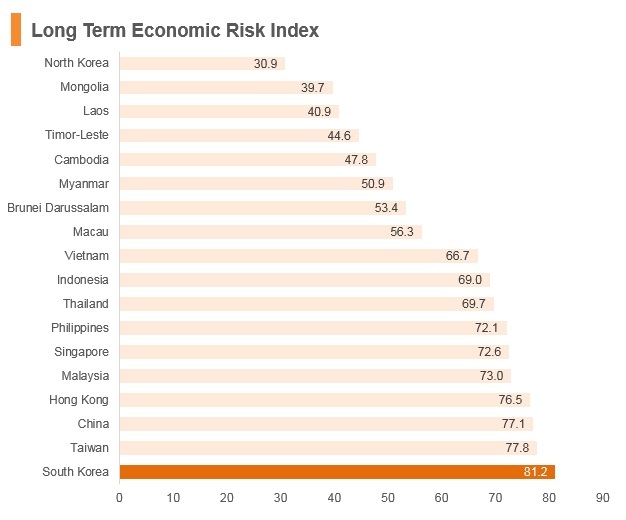 Nevertheless, the South Korean economy is susceptible to sharp drops in international investor risk appetite: for example, it was badly hit by the 1997 Asian financial crisis, while the global downturn in late 2008 caused a dramatic sell-off of the won. 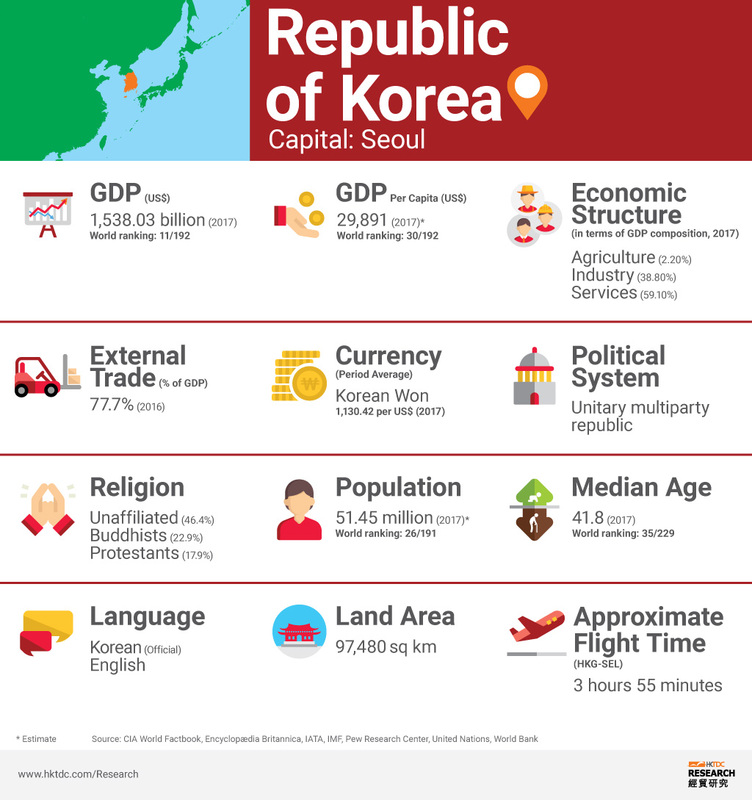 South Korea's advanced and industrialised economy represents an attractive prospect for investment in the Asia region. 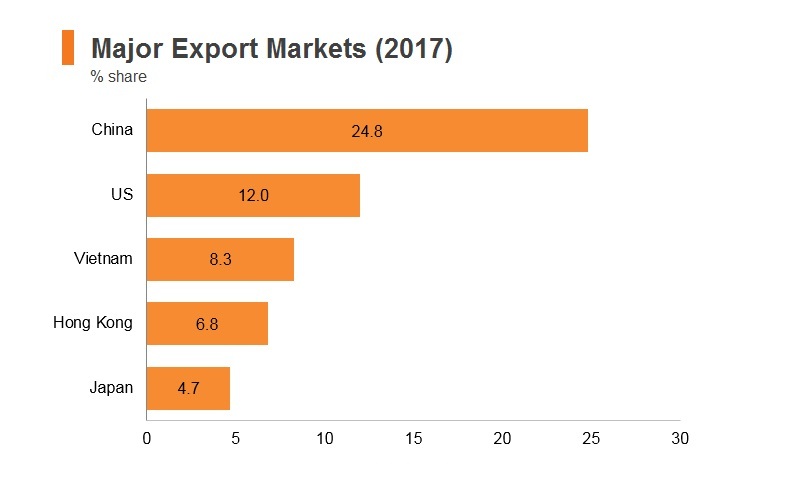 South Korea is both a regional and global trade hub due to its strategic location in East Asia, and attracts considerable interest in its developed and sophisticated manufacturing industry. A stable regulatory regime and numerous FTAs boost its appeal. 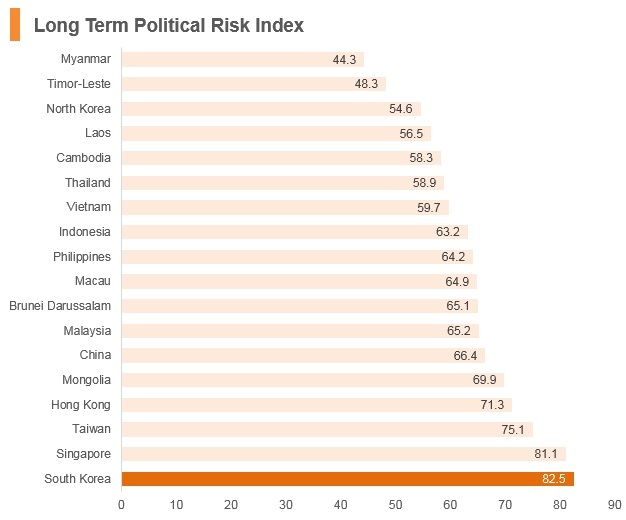 The country offers few operational risks due to its modern logistics networks, a highly skilled labour force and a welcoming policy environment for foreign direct investment. Hong Kong and South Korea have double taxation agreements that cover airline income only. The Korean Chamber of Commerce in Hong Kong, founded in 1976, aims to provide business information and business networking opportunities, and promote commercial trade through various activities to help members build up their business networks. No visa required for up to 90 days' stay.